The little white rose of Scotland plaque canvas. Features a famous poem written by Hugh MacDiarmid. Canvas print with hand painted detail depicting a young girl sitting on the sea shore with a toy boat. I love you to the moon and back canvas. 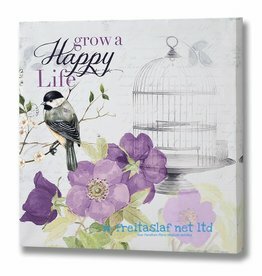 Grow a happy life canvas. White horse hand painted large canvas. A Large canvas depicting a majestic horse. Hand painted large tara Buddha canvas. Large canvas with beach and ocean scene.